In 1936, the Big Band scene was starting to heat up in America, and band leaders responded with a variety of excellent recordings. Meanwhile, across the Atlantic, some very talented European musicians were showing that expertise in jazz was no longer limited to Americans. Tommy Dorsey was a talented trombonist who had played with many of the top Chicago jazz groups of the 1920s and early ‘30s. He would go on to become one of the most popular big band leaders of the era. Although his orchestra would have bigger hits than “I’m Getting Sentimental Over You,” there would never be a better showcase for their leader’s talent on trombone. The trombone tends to have a larger-than-life personality as an instrument, but here Dorsey reigns it in to deliver a soft, sentimental performance. The entire band does a fine job with this material, but it is Dorsey’s rich, graceful soling that stands out and makes this record such a classic. Not long after jazz exploded in popularity in the U.S. in the 1920s, European audiences also began paying attention. Many of America’s top jazz stars, such as clarinetist Sidney Bechet, were able to extend their careers by playing in France. Before long, French musicians were copying the new style and adding their own spin to it. 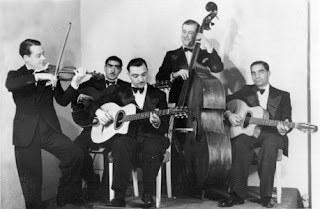 Chief among them was the Quintet of the Hot Club of France, an all-string ensemble of the highest caliber that featured Jean “Django” Reinhardt, one of the all-time great guitarists of any nationality. Reinhardt had only partial use of two of the fingers on his left hand, owing to injuries sustained in a fire when he was 18. This led him to develop his own unique playing style that was as impressive as it was distinct. Reinhardt was a Gypsy and combined the music he had learned in his youth with his passion for jazz to create a new “Gypsy jazz” sound that was utterly spellbinding. “Djangology,” one of his original compositions, showcases his virtuosity splendidly. It is an easy-going piece that features some highly inventive soloing by both Reinhardt and violinist Stéphane Grappelli. The pair perform complex maneuvers in the most relaxed way. Reinhardt’s guitar is the centerpiece. For the first half of the record, he plays an entrancing solo, and on the second half he adds little interjections behind Grappelli’s violin, turning the song into an upbeat, friendly musical conversation. Reinhardt is particularly good at using contrast in beautifully inventive ways. For example, he will lure the listener into a trance repeating a low passage, then suddenly provide an unexpected but lovely, high response. Likewise, in the middle of such beautiful melody, he will keep things interesting with a few well-placed discordant strokes. 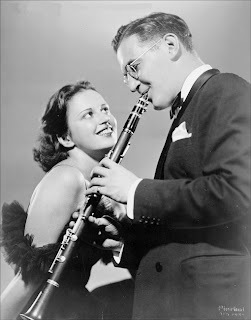 After Benny Goodman hit it big in 1935 with a Fletcher Henderson arrangement of “King Porter Stomp,” Henderson quickly capitalized on the opportunity by reassembling his own orchestra. The band soon had a major hit with this classic, in which the band members improvise a series of superb solos over a highly memorable main theme. Although there were several new faces in the band this time, it is amazing to hear how fully-formed the orchestra sounded. Two of the newest faces provided some of the best highlights: Roy Eldridge’s wailing trumpet and Leon “Chu” Berry’s smooth tenor sax. One can only wonder to what heights they would have soared if Henderson had been able to hold the band together, but sadly they were unable to maintain their momentum and by 1939 had disbanded again for good. After the success of “King Porter Stomp” in 1935, Goodman could do no wrong. He scored 15 Top Ten hits in 1936, including this lovely chart-topper written by Billy Hill. Helen Ward’s vocals are the centerpiece of the record. Her voice is charmingly sweet on the high notes, with a hint of worldly sauciness on the low notes (such as when she sings the words “a little” at the end of each line). Although very subtle, Jess Stacey’s mischievous piano provides the perfect accompaniment. And when the vocals end, Goodman unleashes one of his patented so-sweet-it’s-hot solos on clarinet. Please tell me this blog isn't dead!